On Sunday we travelled on Road 135 from Kilgore to Gladewater, the East Texas Field’s second boom town. In the beginning of 1931 Gladewater had around 500 inhabitants. On 7 April 1931 a little more than 1,000 metres (1 mile) from the centre of town they experienced a “well blow in “ (they found oil) and the oil flowed at 1,000 barrels per hour. In next to no time the population of the town grew to around 8,000. 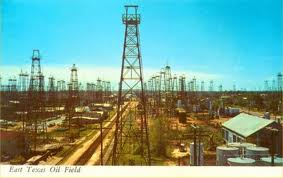 It was not obvious that Texas had an oilfield that was gigantic. Today there is equipment from “discover well Snavely #1” mounted centrally in Gladewater. Texaco, that was the operator of the well, ended production on 30 November 1957, i.e. 26 years after oil was discovered.